Kate MacCluggage and Brenda Withers in Primal Play. Photo by Jessica Osber. BOTTOM LINE: This unusual play is laugh out loud funny, thanks in part to Brenda Withers' humorous portrayal of a chimpanzee. The real life story of Jane Goodall’s disastrous trip to Tanzania -- that entailed having to bring her own mother along, having her students kidnapped by rebels, and attempting to handle the hostage negotiations herself -- provided the inspiration for New Georges' Primal Play, which focuses on a Goodall-like character that has her own disastrous venture into Tanzania. The story is told non-linearly, which creates some moments of confusion, but helps to propel the story’s momentum forward. In this play’s unusual staging, New Georges lives up to its reputation for being innovative and unusual by completely reworking the setup of Dixon Place’s theater so that it is almost unrecognizable. The theater’s proscenium seating has been turned into an elevated part of the stage, having the audience watch the play from the second floor balcony. The effect of this unusual seating arrangement makes one feel as if they were perhaps observing animals in their habitat at the zoo ( a effect that makes sense giving the theme and setting of the play). The show opens with Dr. Valerie Naymark (Kate MacCluggage) conversing with her well-meaning but nagging mother Cynthia (Susan Greenhill) over the clerical work she is doing. She soon ends the conversation as she spies a chimpanzee to observe as part of her expedition. She soon dubs the chimpanzee Lorelei (played with comedic skill by Brenda Withers). 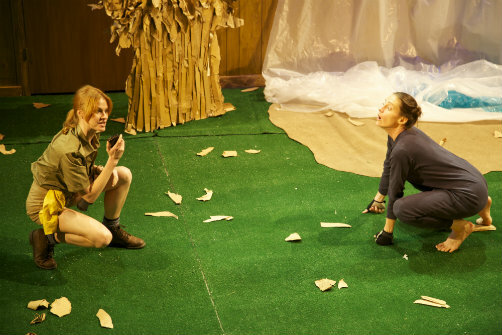 Withers does not rely on a costume to portray a primate, rather she uses animal-like facial expressions and shares her self-absorbed animalistic thoughts out loud, thoughts that the audience can understand but not Valerie, which contributes to much of the play’s humor. In another scene we see Cynthia donning a fur coat and ape mask to engage with Lorelei and reach a level of connection Valerie never is able to. She serves Lorelei tea with a porcelain tea cup and later olive filled martinis. She explains to Lorelei the function of a spade for digging and explains to Lorelei that if she digs in front of Valerie she will be displaying uncharacteristic chimpanzee behavior and she will be seen as special. In another scene we see Valerie rather calamitously trying to negotiate the return of her students after they are kidnapped by rebels in exchange for ransom money. As the scenes roll on Valerie’s expedition seems to be growing increasingly disastrous, aside from the success at discovering Lorelei’s surprising behavior. New Georges’ production of Primal Play is a unique one, one that stands out in one’s memory as its subject matter and clever staging make it an experience that is peerless amongst one’s theatrical experiences. While the story and dialogue start out slow, the production gains momentum by the end and eventually succeeds in capturing the audience's full attention. Withers is especially entertaining as Lorelei, as she shows a knack for physical comedy, delivering lines in the impulsive manner in which an animal would likely speak. MacCluggage is also especially convincing at conveying Valerie’s self-absorption and cluelessness. If the rest of the offerings in the Jam on Toast festival are as inimitable as this production then they are surely all worth seeing.